In this post, we examined 5 of the best-selling mouthwashes on the internet. If you just want our quick top picks, check out the comparison table below- we list out the ‘specialties’ of each mouthwash. From teeth-whitening to breath-freshening. Mouthwash is a liquid that people use to either freshen breath or kill germs that build up in the mouth. Some mouthwashes are also used to assist those who have trouble producing saliva (Source). As mentioned, some mouthwashes are anti-bacterial and contain chemicals to kill germs that cause bad breath and other maladies. Some mouthwashes use alcohol to kill germs while others use detergents to help keep teeth clean (Source). 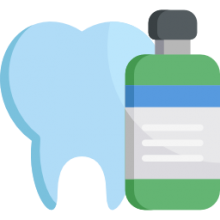 There are numerous types of mouthwash products on the market, but many dentists and oral experts recommend getting a mouthwash that contains fluoride to help strengthen teeth and prevent gingivitis while keeping your breath fresh (Source). In this article, we look at 5 popular mouthwash products. Colgate Total Advanced is a mouthwash that has a fresh mint flavor. It’s designed to remove bacteria that can lead to bad breath and gum disease. It’s also formulated to help remove plaque and does all of this without alcohol, which can burn. This mouthwash is made up of two distinct liquids, which must be shaken to mix properly before use. While most users said it kept their breath fresh, some said it left an oily after residue. Crest 3D White mouthwash is a multi-care product that is formulated to whiten teeth by removing stains, freshen breath and prevent problems like gingivitis. The triple action formula also helps your teeth resist stains. While some mouthwash products are said to make teeth overly sensitive, most users said this product does not. 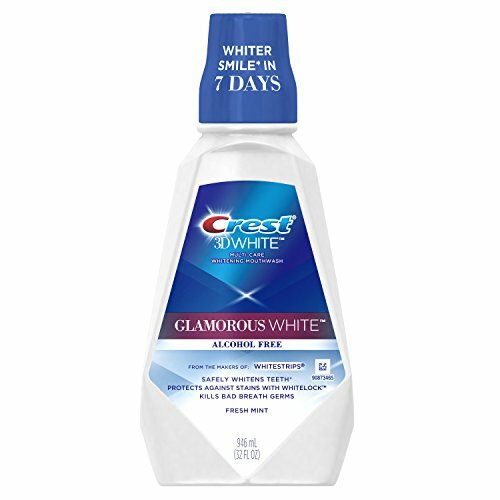 Additionally, some said that it’s not the best tasting mouthwash, but they did notice a difference in the whiteness of their teeth after a few days use. Oral Essentials claims to freshen breath without harsh chemicals or alcohol. A more natural approach, this product is certified to be non-toxic, sugar-free, dye free, preservative free and BPA free. What’s unique about this is that it’s dentist formulated and designed to be an all natural alternative to those “brand name” products you find at the drugstore. If you find that most mouthwash products burn or sting due to alcohol or harsh chemicals, this could be the right product for you. Next up is another all natural product called Dental Duty. This mouthwash is designed to remove plaque and bacteria and leave your breath fresh without the use of alcohol and other chemicals. This product is 100% made in the USA with ingredients like: Tea tree oil, aloe vera, and peppermint. Buyers noted the lack of alcohol sting and the mild flavor that isn’t overpowering. Last up is the dentist recommended TheraBreath oral rinse. While other mouthwash products help with plaque, gum disease and breath, this one specifically targets bad breath. It is certified vegan-friendly, uses no alcohol and leaves your breath with a mild mint scent which doesn’t overpower the way other mouthwash products do. Most reviewers said the product works as advertised and liked the mild flavor. This dental recommended mouthwash offered by TheraBreath works fast, lasts long, and it’s an excellent choice to get rid of bad breath. Users love that the product doesn’t contain alcohol, but some do note that it leaves a bad aftertaste. The TheraBreath oral rinse neutralizes bacteria in the mouth and deals with the bad morning breath and food odor. Another great thing about this oral rinse is that it will keep your breath fresh for 24 hours if you follow the provided instructions carefully. Moreover, this mouthwash has no artificial flavors or colors, it’s gluten-free and certified vegan. But it has a mild mint flavor, which won’t sting your mouth. 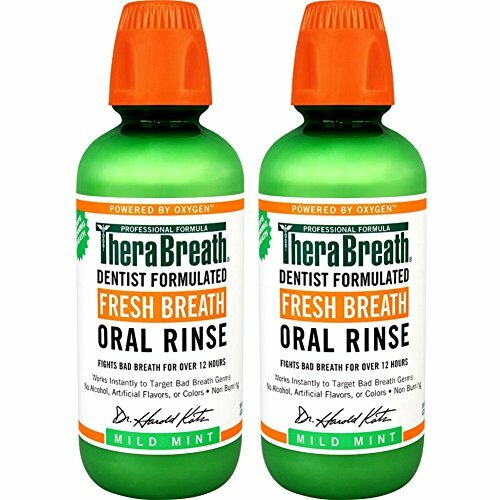 As a whole, buyers have a favorable opinion regarding the TheraBreath dental formulated mouthwash, and they are pleased with the results. A buyer comments that this is one of the best mouthwash brands and that it helps with mouth dryness. He adds that it doesn’t burn or string when he gargles and that his breath is fresher than ever. Another reviewer states that the mint flavored mouthwash doesn’t dry his mouth and that he doesn’t have problems with bad breath anymore. A user also shares that this is the best mouthwash for bad breath he has ever used. However, some customers have noted that the mouthwash doesn’t work and that it doesn’t keep their breath fresh for more than a few hours. Some also complain that it leaves an odd taste, which takes hours to disappear. If you want to get rid of bad breath, but you don’t want to use Listerine, you can try this all-natural mouthwash offered by Dental Duty. Users love that the oral rinse doesn’t contain any chemicals, but some do note that it tastes a little weird. 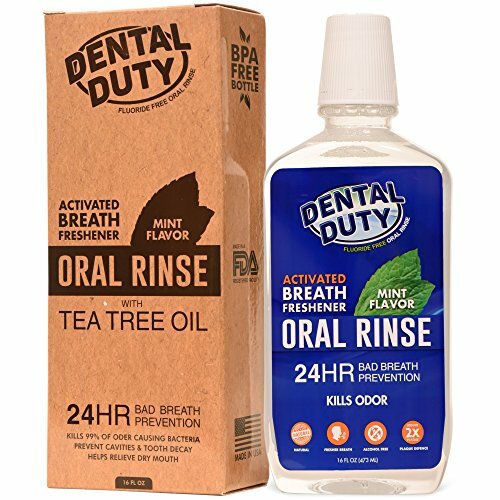 The Dental Duty mouthwash contains 100% natural ingredients such as tea tree oil, aloe vera, and peppermint and no additives or harmful components. Another great thing about this product is that it removes bad breath and dryness and kills almost all bacteria in your mouth. It’s also suitable for women, men or children with sensitive gums. Moreover, the oral rinse comes with 60-day money back guarantee so if you’re not satisfied with the results, you can return it. A user shares that this natural mouthwash doesn’t sting or burn and that the mint flavor is pleasant and not strong. He adds that his breath stays fresh for hours and that the highly recommends this as the best mouthwash brands without alcohol. Another reviewer observes that the oral rinse cleanses his throat and teeth well and that it doesn’t taste like chemicals at all. A user also remarks that the mouthwash arrived quickly and that it combines well with a natural toothpaste. However, a few customers have noted that they don’t like the taste of the mouthwash and that they are disappointed by the results. This dental-formulated oral rinse offered by Oral Essentials is non-toxic, safe, and contains no alcohol or harmful ingredients. Users love the mouthwash doesn’t burn and refreshes their breath, but some do note that it’s too expensive for their taste. 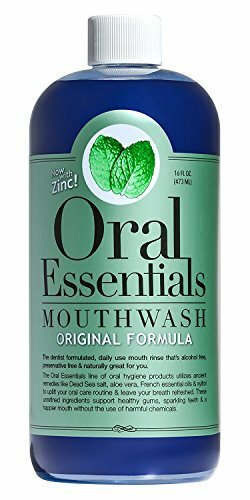 The Oral Essential mouthwash uses only pure and unrefined ingredients – dead sea salt, aloe vera juice, essential oils and Non-GMO Xylitol. Another great thing about this product is that it’s specially designed to keep your gums moist and pick and take care of your teeth. Moreover, all mouthwash ingredients have been selected carefully by professionals so that you can get all the benefits of using an oral rinse. A reviewer shares that he usually hates using mouthwashes, but the Oral Essential mouthwash has a pleasant taste and that you quickly get used to it. He adds that the product arrived well-packed and that he highly recommends it as the best mouthwash without alcohol. Another user observes that his mouth feels better after he started using the mouthwash and that he doesn’t have problems with bleeding gums. He highly recommends it as one of the best natural oral rinses. A buyer concludes that the Oral Essential natural mouthwash is perfect for people with sensitive teeth. However, some customers have noted that they don’t like the taste of the mouthwash and that they don’t feel any positive effect. If you’re searching for an alcohol-free mouthwash to deal with bad breath, you might consider this multi-care mouthwash offered by Crest. Users love the flavor, but some do note that they received only one bottle instead of three. The Crest 3D multi-care oral rinse contains glycerin, propylene glycol, hydrogen peroxide, sodium hexametaphosphate, poloxamer 407, sodium citrate, sodium Saccharin, and citric acid. It uses a unique Whitelock technology and a triple-action formula, which whitens the teeth, protects them against stains, and kills breath germs. In addition to this, it freshens your breath and prevents future stains on your teeth. It’s suitable for children 12 years and up, and it’s safe for daily use. In general, reviewers are happy with the Crest 3D multi-care mouthwash, and they recommend it as one of the top mouthwash brands. A buyer comments that the oral rinse has a saltwater taste, but it does whiten your teeth. He adds that you’ll notice an improvement in a week. Another reviewer shares that he has been using this alcohol-free mouthwash for years and that it doesn’t burn or sting. A purchaser mentions that he started using the mouthwash every day and that it works well and taste great. However, several customers have noted that they don’t see a difference in their teeth’s color and for some, it has a strange, unpleasant taste. 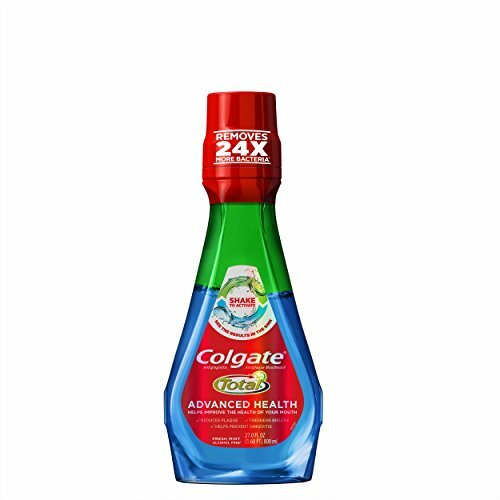 This advanced health oral rinse offered by Colgate Total is effective, alcohol-free, and useful for preventing gingivitis. Users love the quality and price of the product, but some do note that it leaves an oily residue in the mouth. The Colgate total mouthwash has a unique two-layer formula, which removes 24 times more bacteria than regular oral rinses. The top layer freshens the breath, while the bottom one contains bacteria-killing ingredient – cetylpyridinium chloride. Another great thing about this product is that it kills 99% of the germs on contact and it reduces plaque. Moreover, this antibacterial mouthwash doesn’t contain fluoride or other harmful ingredients. A user mentions that the Colgate anti-plaque mouthwash looks strange at first, but it works very well. He warns that it’s hard to shake the bottle to mix the layers because the bottle is too full, but it gets easy. Another buyer states that the mouthwash leaves his mouth fresh and clean and that the feeling lasts for hours. He highly recommends it as one of the best mouthwashes available. A purchaser adds that the oral rinse doesn’t burn and that the taste is not so bad. However, some customers have noted that the two layers separate almost immediately after you stop shaking the bottle. Some also remark that the cap is not well-designed and that the bottle gets oily and greasy. Fluoride prevents tooth decay as it helps your body to strengthen enamel — the harder-than-bone, white substance covering teeth. However, there are a lot of people who do not need fluoride-containing mouth rinses. They get fluoride for protecting their teeth from a fluoridated toothpaste. Though, there are a few exceptions. People suffering from xerostomia (abnormal mouth dryness) might use mouth rinses of this kind. Among other reasons are dental caries (cavities). If a person has a severely dry mouth, that results in the bacterial balance of a person’s mouth to change, while if the number of bad bacteria is too high, it can cause tooth decay. These problems can be prevented with fluoride mouth rinses. You can consult your dentist to find if you are not using such toothpaste. And if you are not, it would be very useful for you to start using fluoride mouth rinse to improve the condition of your oral health. There are many mouth rinses with which your breath will smell pleasant, but, they do not always offer long-term benefits for your dental health. Cosmetic rinses result in mouth odors reduction. Some of them kill bacteria, but it does not have a long-lasting impact, and they do not make any changes to your health condition. The bacteria killed by such mouth rinses will eventually grow back, and you will in the short-term have fresh breath in, but these rinses will not, in fact, make your oral health condition better. It is a very good idea for adults to include such mouth rinses with brushing and flossing. Despite the fact that flossing and brushing are necessary factors of good oral health, most of us do not always pay proper attention to doing the job in a right way. Anti-gingivitis and anti-plaque mouth rinses will highly improve your dental care habits as they will kill potentially damaging bacteria. In case it has the ADA (American Dental Association) seal of approval, it means that everything claimed on the bottle has been scientifically verified. These rinses kill a spectrum of bacteria different from the ones killed by the breath-freshening rinses. Very often oral bacteria result in gum disease, so if you use a rinse which eliminates these organisms, it will improve your overall oral health. Those people who have more serious oral health issues need to be prescribed stronger mouth rinses. There is another level available by prescription for fighting advanced plaque and gingivitis. This will help keep inflammation down. In fact, mouth rinses serve a purpose, no matter to freshen your breath, help fight gingivitis and plaque, etc. But, mouth rinses cannot be a substitute for regular brushing and flossing. You’d better not get lazy with your everyday toothbrush and dental floss. Also, remember to pick rinse product with the ADA seal of approval when choosing one. The major difference between a rinse and a mouthwash is that rinses protect teeth from acid, while mouthwash freshens your breath. Please note that a fluoride mouth rinse or a mouthwash must be used after you are done with tooth brushing and flossing. Also, remember that mouth rinses or mouthwashes are not recommended for kids younger than 6 because kids of that age might be inclined to swallowing the rinses instead of spitting them out.